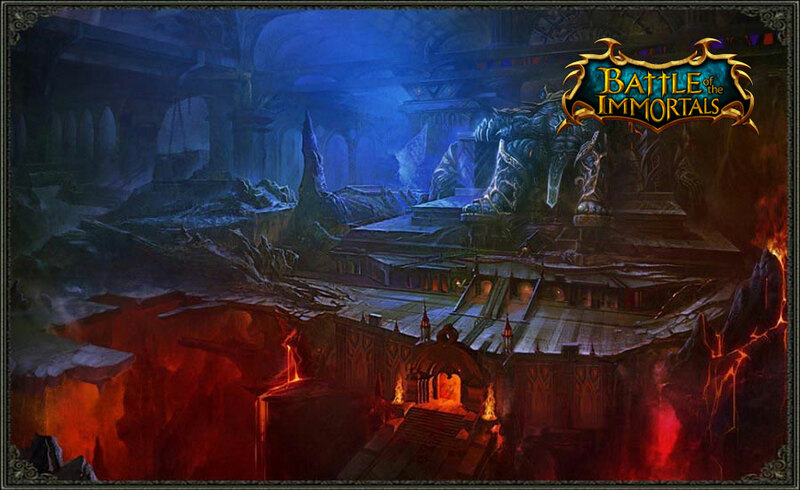 The Battle of the Immortals Titan Update in July will introduce two new maps for players to explore. The new adventure will start here with the Black Dragon Lair and Giants Kingdom! Each map have its own unique boss challenge, and each one loaded with stalwart Soul Gears, and crafting materials that will prepare you to face the God King himself: Kronos!! If you are seeking fame and fortune, then you will want to investigate into the Black Dragon Lair. But be weary of the indwellers!! Fenrir, protector of the treasure, will burn all intruders after their loot to cinders! Moser, the mother of all dragons is no easy prey either. With scales tough enough to withstand the strongest weapon, and her black feathers is immune to any elemental magic. She will remind her adversary why she is the strongest creature alive!! The Ancient Black Dragon, Moser! The once glorious Giant Kingdom is now nothing more than abolished ruins, inhabited by slaves and technology the Giants have left behind. The remains are being protected by the sentinel Gunk, a robotic magnum opus created with the sole purpose to protect the kingdom. Gunk has now taken over as the ruler of the kingdom, with the aid of other outworldly creatures and mechanical automations; they prohibit any outlander to enter, and will eliminate all threat by any means possible!! Gather your friends and armor yourself to the teeth, meld a powerful Third Generation pet before your set out to these new lands. Because against these elite adversaries, you will need every kind of help you can get. As swords clash and spells fly, the Immortals have rallied under a single driving force: to search for the three divine relics that can find Odin, the God-King. With the first of these three artifacts found, it would almost seem that victory is in sight for these valorous heroes. It is in these moments when the Light shines the brightest, however, that the Darkness casts its largest shadows. On the peak of Mount Olympus, traitorous blood endangers all the Immortals have fought so dearly to gain. Demitrios, High Priest of Motenia, begins a morbid blood ritual. Once a man of great faith and piety, a hero of Motenia who led the Immortals into battle against the Dragon Emperor, has fallen in battle. Corrupted by those that he warred against and twisted with hatred for those he thinks abandoned him, he commits his greatest act of divine power yet: the corruption of Cronos, King of Gods. High atop Mount Olympus at The Titan's Throne, Demitrios begins his twisted ritual. Invoking ancient rites and forbidden dark magicks, he awakens the slumbering God-King. Crying out to Cronos, Demitrios plunges a dagger deep into his heart and offers up his own blood, black as tar and just as thick, as a sacrifice. 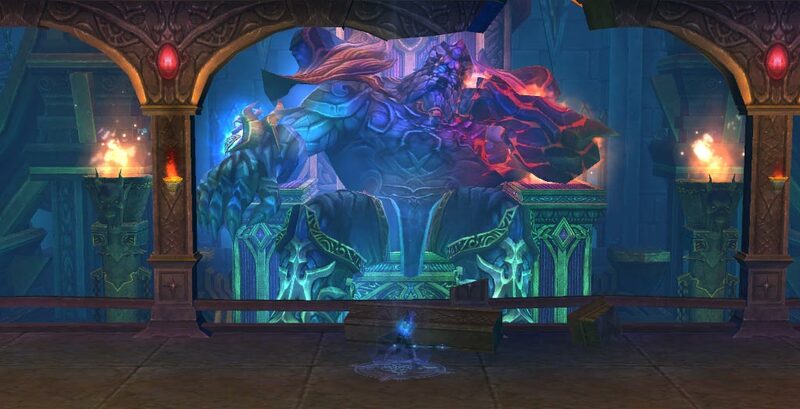 In that moment, Cronos, once benevolent and just, becomes infused with all of the hatred, all of the torment and all of the bitter agony in Demitrios' soul. With a roar that makes the Heavens themselves quake, Cronos lurches from his resting place to wage war upon the Immortals! The fate of the world is once again resting in the hands of those brave few that could dare to stand in the path of Cronos' vicious might. The heroic Immortals of Motenia must venture high up Mount Olympus to wage war upon The Titan's Throne and muster the strength, the will and the courage needed to defeat the God of Kings himself, the mighty Cronos! Double the coin storage, HP and MP regeneration, the ability to vend items from the field, and more! It's the Noble System! Read on to learn more! 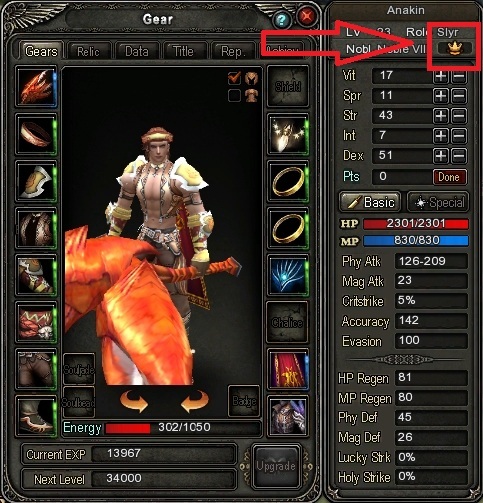 The Noble System in Battle of the Immortals can be accessed by clicking the crown icon in the upper right hand corner of your character equipment screen. This system will provide every character on your account a large variety of bonuses and perks for transferring Zen to spend in the marketplace. The Noble System perks are broken down into eight different levels. As you reach each milestone, the next level will be unlocked, and you will gain the bonuses that that level has to offer. The bonuses are on a timed system that you can continuously refresh by simply transferring more Zen. 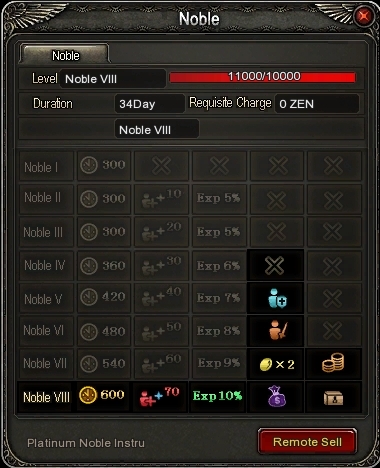 For example, by transferring 1,000 Zen to your server, you will automatically be kicked up to Noble rank 4 for a total of 16 days. You'll be granted an extra hour of double experience time, 30 points of HP and MP regeneration per 10 seconds, and 6% bonus experience for the duration of those 16 days. When that time is up, you will be bumped down one level in the Noble system. 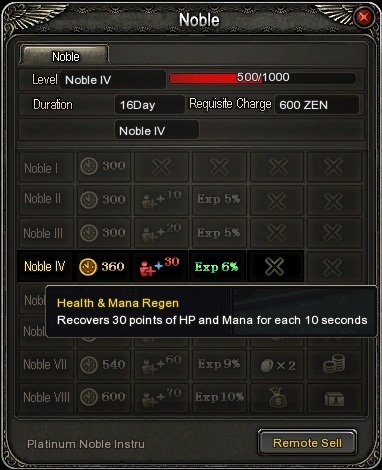 At Noble rank 8 - the highest level possible - you will have 70 points of HP and MP regeneration per 10 seconds, double the coin storage capacity, double the zeal generation rate, the ability to vend and repair equipment from the field, infinite duration portable stash, bonus experience, and more! So, if you're on the fence about picking up a few things from the marketplace, keep in mind all of the great incentives that await!